The ideal experience for art and architecture lovers in Madrid. You’ll take a fully-guided tour of one of Europe’s premier art museums and enjoy a close encounter with works by Raphael, Goya, El Greco, Bosch, and more. The highlight is Velazquez’s beautiful and enigmatic “Las Meninas”, one of the most famous works ever painted; learn what makes it great as well as why it still holds many mysteries. 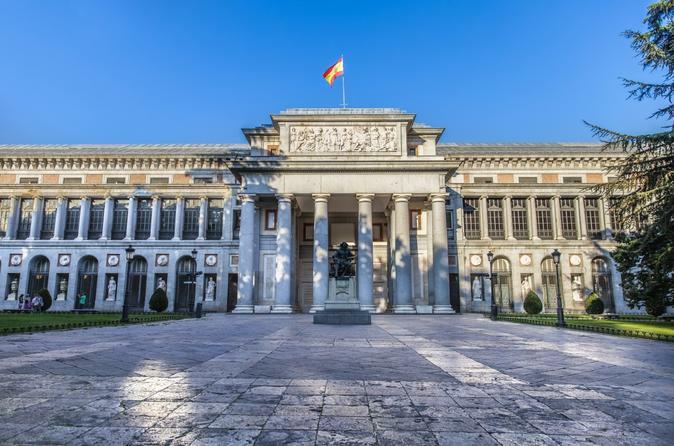 You’ll also stroll down Madrid’s prettiest street, the Paseo del Prado, to see stunning monuments and buildings, like the Banco de España, and learn about the city’s royal history from your local expert guide. Take a stroll down Madrid’s most famous and beautiful street, the Paseo del Prado, stopping at iconic monuments like the Cibeles Palace, Banco de España and the fountains of Neptune and Apollo. These structures reflect Spain’s glorious past as a global empire, and your local expert guide will tell you the story of the empire’s rise and fall. Skip any lines at the Prado Museum and enjoy a full tour of one of the greatest collections of art on earth. This used to be the private collection of the Spanish Crown, and today you’ll gape at paintings by Goya, Rubens, Titian, El Greco, Hieronymus Bosch, and the largest collection of works by Italian Masters outside of Italy. The highlight is Diego Velazquez’s “Las Meninas”, one of the most coveted and mysterious paintings ever made. Your guide will explain its significance as well as the mysteries that still surround it. They have spent years studying art and will help you decode everything you see in a way that is both accessible and engaging. Whether you’re a seasoned art lover or rarely set foot inside a museum, you’ll walk away with a much greater appreciation for fine art and the royal splendor of Madrid. This is the perfect tour for anyone who wants to get an inside look at the cultural patrimony of this great city with a local expert on hand to give you all the background and context behind the things you see and experience.